In the summer of 2009, I rescued a roadrunner (Geococcyx californianus) from drowning in the circular water trough in the Well House Corral. 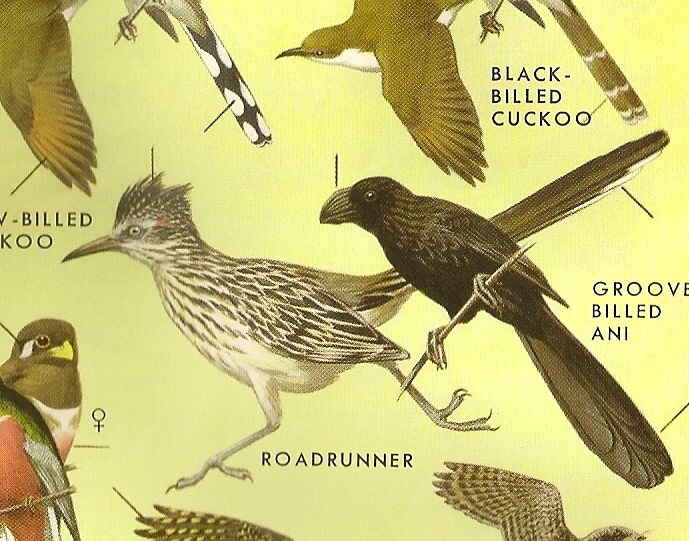 Roadrunners occupied a minor niche in my bird and animal kingdom as I grew up in central Texas. My Aunt Lennie McRorey who lived on a ranch with her husband in San Saba County, Texas, kept a minor collection of roadrunner figurines and commissioned a small oil painting of a roadrunner that my daughter displays on her end table in Lubbock. Driving down highways and especially back roads, roadrunners flew or ran across the road in front of the car. I never saw any remains of roadrunners beside the road, attesting, I think, to their agility and speed. They were big and seemed amusing the way they ran and picked at insects along the highways. In a way, the roadrunner to me seemed unique among birds, more of an ostrich-like being than a flight creature — a miniature ostrich, for sure. When we moved to our ranch in 2003, I saw roadrunners occasionally along our county road, but in 2008 and 2009, I noticed a pair of roadrunners that nested or habitually occupied the Well House Corral next to the Dooley Pond and mesquite brush to the west of our fence line. As are most of my discoveries here on the place, my initial observation was accidental. I was resting in the shade of the barn alleyway one hot summer day in 2008, when I saw a roadrunner dart from well house to the arena and under the trees in the corral. Initially, I saw only one, but after a few more sightings during the summer, I saw two of them. They often flew up in the lower branches of the live oaks and sat in the afternoon. At the most, I spent thirty minutes watching their antics in the lower branches, wallowing and playing in the arena, and then I followed their hunt towards the east and our stock pond. The summer of 2008 came to a close and I did not see them until the next summer. 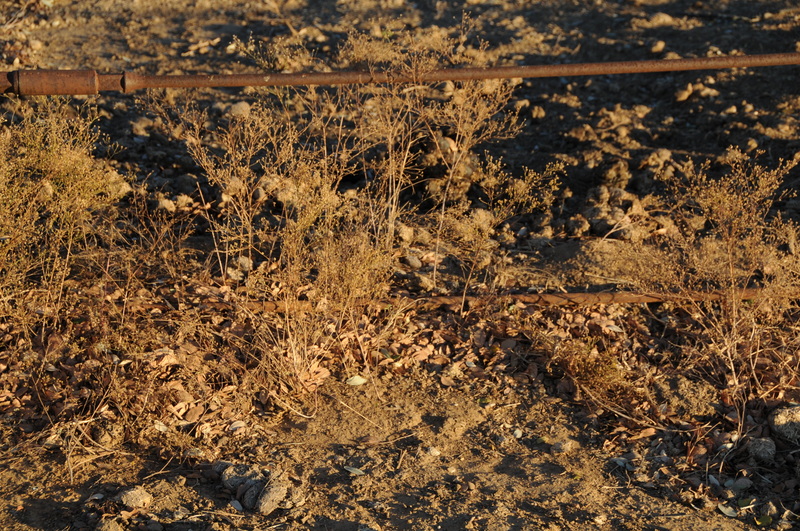 Water trough in Well House Corral that ensnared roadrunner. 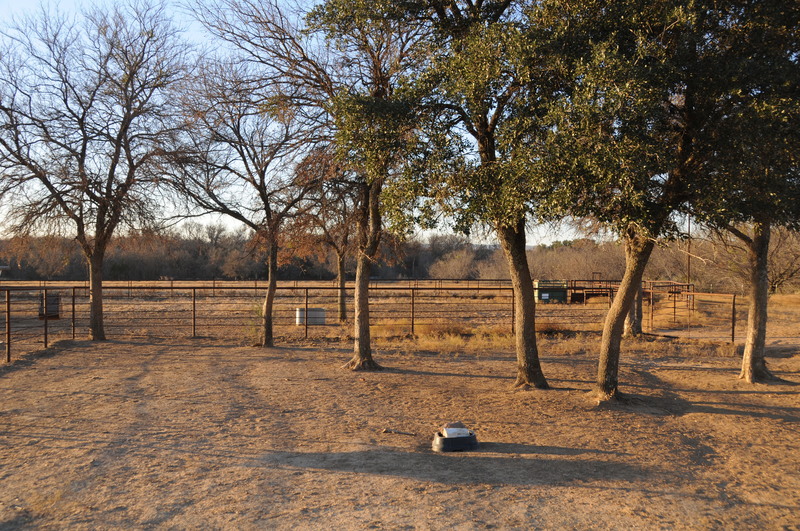 I had set a circular water trough in the Well House Corral for cattle and horses. 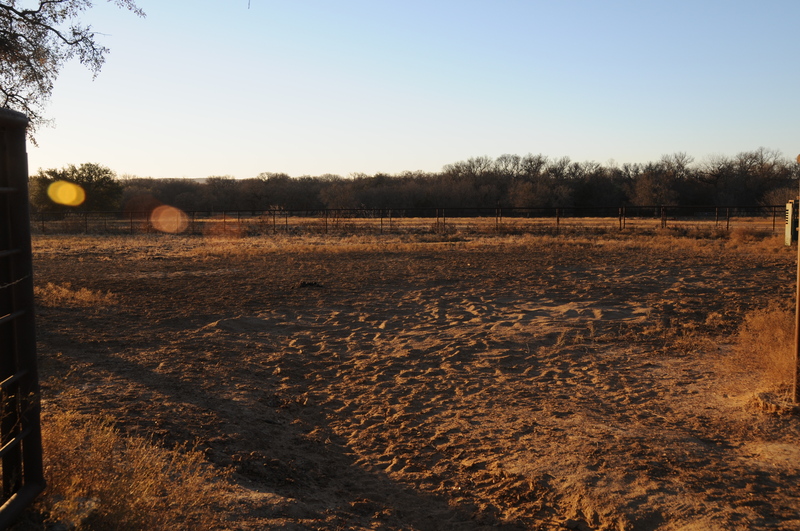 The trough was large, about six feet in diameter and held enough water for two or three days for cattle. One afternoon in the summer of 2009, I walked down to the trough to check its level and noticed that the water was greenish and appeared disturbed. Live oak leaves fell in the trough, and algae grew about the leaves and errant grass stems. As I looked at the level of water I saw a long, log-like thing in the water. It was listless, dead. I looked closer and realized it was some kind of animal? I thought at first a very large squirrel or possum? Then, the parts all came together and I realized it was a roadrunner, one of the roadrunners I had been observing for two summers. I thought, How could you have gotten drowned as crafty and smart as you are? Oh, no, you poor thing. I beat myself up for a moment, thinking I should have kept the water level higher so that if he had wanted a drink, he could have perched on the edge. Well, I had to get him out of the water or it would become contaminated. As I reached over to pick him up, his eye blinked! Good god almighty, he’s alive! I gotta get him out of there. As I reached over to pick him up with my bare hands, I stopped. The roadrunner could turn and peck me mightily, drawing blood. Several years ago I had grabbed a mockingbird that had become caught in some netting I used to protect ripening grapes in our vineyard and the mockingbird had turned and pecked my finger in two places, drawing blood before I could let it go. Pecked by a mockingbird is one injury, but a roadrunner peck may be a wound to the bone. Seeing that the roadrunner was exhausted and I had to do something fast, I ran back up to the barn and grabbed my sombrero that was large and a couple of warm, fresh towels I used to groom horses. 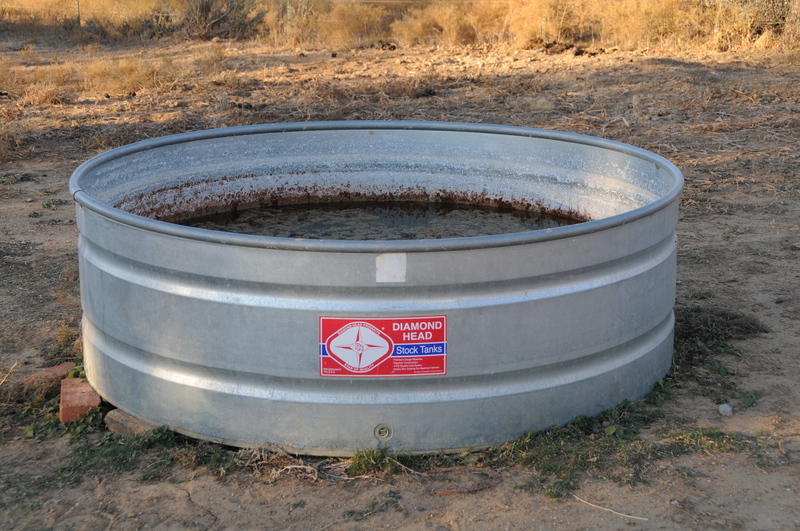 I hurried back down to the water trough and dipped the sombrero under the roadrunner and lifted him out. He was still blinking, but not moving at all. He was huge. I never knew how big these things were. He was at least two feet long! Think a small ostrich. I put the roadrunner and sombrero on the ground and gently gathered him up in the towels. With one towel I held him and the other I dried him off thoroughly. With each stroke of the towel, going from head to tail, he would stretch his neck and extend his body as if running. As he would stretch, his neck area would reveal sparse feathers and tender skin. I saw no lesions or breaks or fractures. I continued for five minutes or so drying him off. Now what to do? He was not standing or trying to fly off. I decided to keep him on the towel and take him to the arena where it was sunny and warm and away from our barn cats. I placed him down alongside the arena panels, near an area that I had seen him and his mate play. He remained still, but was beginning to stir a bit. I walked back up to the alleyway where I could monitor him and watched. After about thirty minutes, I saw him stand up and begin to fluff his feathers and preen. This went on for fifteen minutes. I had to move on to other chores and left him alone. An hour or so later, I went back to the arena and checked on his condition. He was gone, most likely over the fence line to the Dooleys and his mate. I’ve often wondered, fantasy-like, Borges-like, that somewhere in Mexico after he had recovered, this roadrunner told a story to his friends about a sombrero, the marvelous power of a hat that came down out of the sky and carried him out of water to dry land and life again amongst the cactus and creosote of the desert. Just a fantasy. The sombrero that was used to rescue the roadrunner. This last summer, 2010, I have not seen any roadrunners in the Well House Corral. 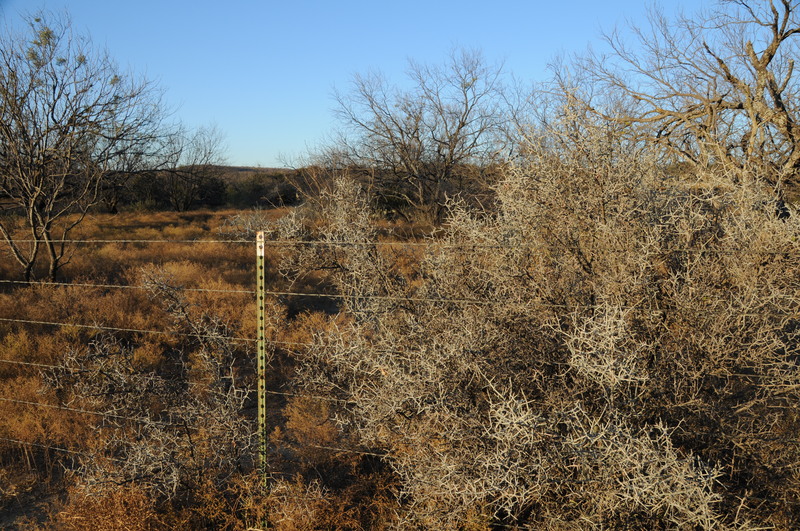 Our neighbors to the east have cleared a lot of brush from their property and deer and other critters have moved southward, into the grove and far pasture, so the habitat for the roadrunner has changed. I continue to look for them. I know that observing the roadrunner in the wild is most infrequent and I am motivated to observe more when I can. 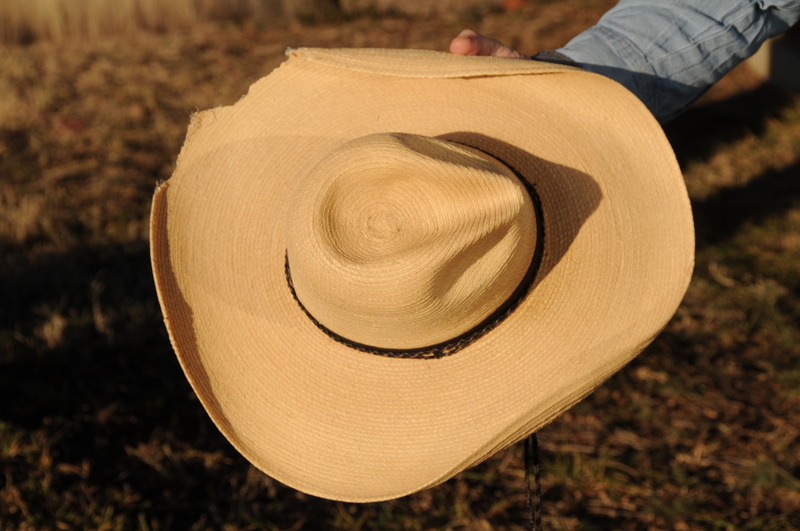 In the photograph of the hat, you will notice two bite marks out of the rim. Star, my paint gelding, reached through the stall and took two chunks of straw out of it while I wasn’t looking. The hat is made by SunBody hats www.sunbody.com and is constructed from palm leaves in Guatemala by Jose Medrano. Towards the Dooley Pond where the roadrunners have their nest. The live oak trees where the roadrunners sat. The arena where the roadrunners played. The spot where I put the roadrunner to dry off. Senor Jack wearing the hat that saved the roadrunner. I’ve only seen a roadrunner once, and it was while driving along a freeway in New Mexico – it was scurrying across an exit ramp, and because I was hurtling along at 70 mph I was already past it by the time I realized what I’d seen. There was no way to stop and go back for another look, but I whooped happily and loudly in the car by myself. Rebecca: I’ve traveled a lot by myself and have whooped loudly at wild things I have seen. Up in New Mexico one time I rounded a turn and there was this long stretch of aspens turning fall colors. I said a lot of things when that happened. Roadrunners have solid habit patterns for browsing, I am told. So I will be more careful next summer in observing if they reappear. Good for you! I’m sure the Roadrunner would have thanked you if it could. Thanks. I looked at your blog and I really like it. I put it on my blogroll. I think I can hear the thanks from that roadrunner. I wish I could see them next summer. Here’s hoping. What a wonderful story Jack! Saving a roadrunner with a sombrero, how fitting. You have a real knack for spinning a story, and this one had me smiling from ear to ear. Thanks, Bill. You are welcome. I’m trying to write a little more humor or find some more humor in our treks out of doors. It was a hoot trying to take care of that roadrunner. It really spooked me when it opened its eye! Like in cartoons, I thought I saw “Xs” for his big eyes, and, then, it’s alive! I still impressed by how big it was. I wish you had been with me. I really needed help. Brenda was at work and I have this huge roadrunner on a sombrero. One thing that always comes across when you and I work together is your positive, upbeat attitude about training horses. I always feel better when I get your observations. Thanks for what you are doing with Fanny and Hija. I love it Jack! Thank you for saving that sweet bird! Last week as I was having a conversation with a friend and co-worker out at the Mandala Center on the eastern plaines of New Mexico, a road-runner jumped up and peeked through the window as if to eavesdrop on our words. It was such a great moment! He cocked his little head back and forth. It was the sweetest thing! What a picture! Roadrunner on the window. Eavesdropping he was! That’s a fantastic moment for you. Have a merry Christmas, Kristy! Jack, this is one of those stories that could be made into a documentary. I’ve never seen a roadrunner *blushes* and didn’t realize they were so big, that their peck was so lethal. I also didn’t realize that they were so infrequently seen. Wow, what an adventure you had (Star, too, for nibbling). And an adventure with a happy ending, as RR flew away. Nicely done, Jack, very nicely done! Thank you for sharing! Kittie: Yes, Star had a bit part in all this. I had put the hat on a halter rung outside his stall. He stuck his nose and mouth through and took two bites. I didn’t notice at first when I put the hat on. 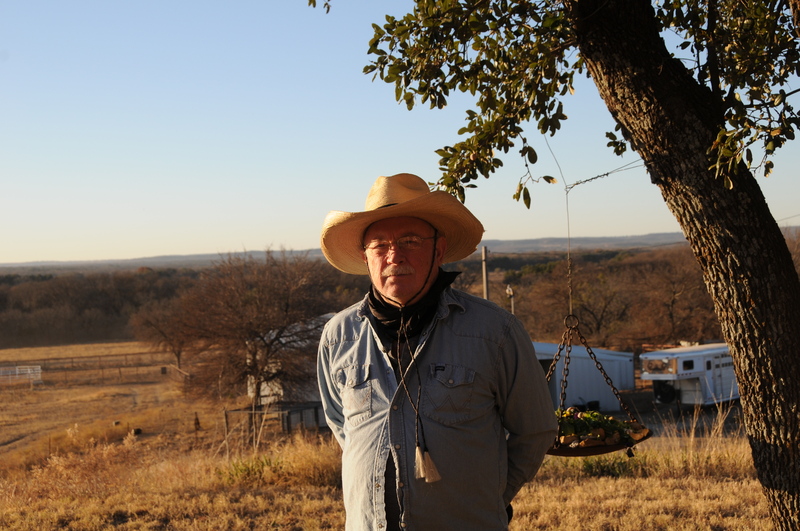 On the day I saved the roadrunner, I had the hat in the pickup, I think, and used it instead of the towels. Just a matter of choice, my thinking the straw hat could give him support. LOVE this story Dr. Matthews! Thank you for sharing it. You tell such great stories that you really should write book. Now every time I see a roadrunner I am going to think “little ostrich.” By the way the Ghengis Khan book was fascinating I thoroughly enjoyed it. Thank you! Erin: Glad you like. I kept trying to find a place it would fit in our World Civ class, but never found it relevant to what we were studying. So, I had to write about it this way. Thanks for commenting on the Ghengis Khan book. Hope your holiday is going well. The same exact thing just happened to me. So I did everything you said you did and now I’m waiting! This literally just happened. I hope he makes it! He’s a pet we ve been watching for a few years. Good that you saved him and given him a second chance. Let me know how it turns out.